‘Without its Pier, Clevedon would be a diamond with a flaw.’ Sir John Betjeman, 1980. Celebrate the grand re-opening of Clevedon Pier on May 23rd 1998 with colourful coverage of an unforgettable day. Clevedon Pier was opened on Easter Monday, 1869, since which time it has been the town’s best loved landmark. However, following its partial collapse in 1970, there were moments when it seemed that the Pier would never be restored to its former glory. 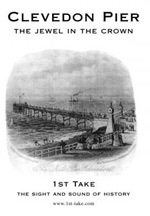 This documentary, produced in association with the local Civic Society, is a celebration of the Pier’s grand re-opening. Re-live its history, and then join in the magnificent Victorian pageant which marked the completion of 28 years of determination to see the Pier survive.